In Camille‘s class today we painted at Helen Putnam Regional Park in Petaluma. 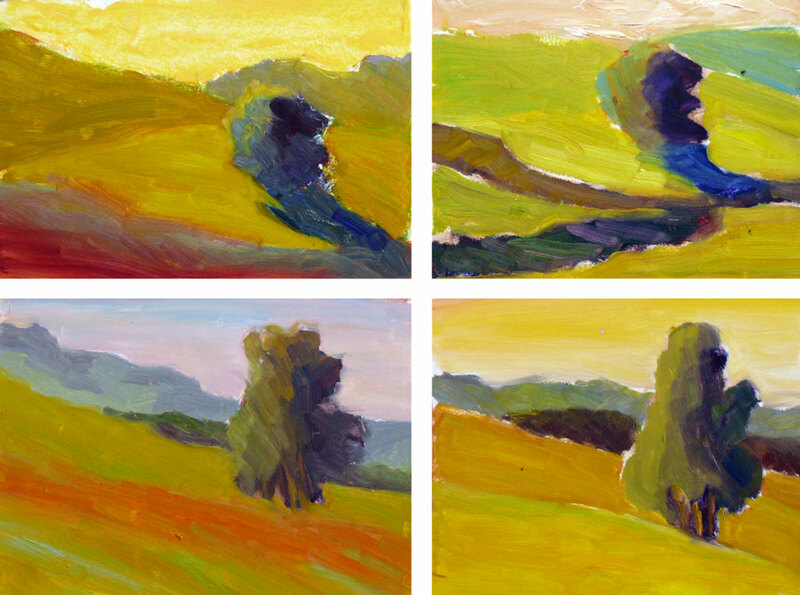 Our instructions were to paint four small, very quick (about 20 minutes) starts (sort of like rough drafts in oils) on one 12×16″ panel. If I understood correctly, we were to try to capture the color temperature of a bright sunny day, the relationships between the hues and values, and the relationships between the distant, mid and close up values and colors. And all of this without using green to paint the extremely bright and vibrant lime green hills. I’m at the point now with this work where I feel like I’ve been living in a foreign country long enough (the land of plein air oil painting) that some of the words the natives (my teachers) speak are starting to be understandable. I still can only respond with grunts (see above “painting,” — definitely no more than a few grunts!) but I kind of get what my teachers are saying. I’m starting to see the vivid colors in nature beyond the local colors (green tree, red apple). And I’m maybe starting to understand why you might paint a sky a pale yellow before over-painting it with very light blue, or a green hill orange first because it’s in the bright sun, and then modify that orange with something that, when compared to the color next to it, reads as green. Previous Post: Vegetable Medley to Celebrate: Taxes Done! These are just wonderful, lucky you to have a class with Camille. I especially like the bottom two, such interesting studies, with such great colors. This might be cool framed as a piece, what do you think? I can really see the atmosphere in these … way to go Jana!Oh how envious I am ……. I can’t wait “to see the vivid colors in nature beyond the local colors (green tree, red apple). ” What am I missing? is it anything you can put in words and share with me. Would you ever have guessed, after we both have been watercolor aritists, that we had never learned to “see” before? I like the third one best. What an interesting project. Do you like the paintings of Gauguin? I saw several of them at an exhbition one time and was surprised that the colours were more subtle than the book illustrations I had seen. Way to go -to explore colour. OH YES, Jana!!! I love these — and look at all the GREEN you’ve achieved with the tube of green paint!! Very very bright and atmospheric ‘starts’ … The ‘hottest’ for me is the bottom right — such high notes of color suggest such a nice warm — almost hot — day! And I can’t agree with you more about the ‘language’ of the instructors — it’s like when you finally understand it — or sort of understand it — all of a sudden you SEE the world a little differently — magic, me thinks! Jana these are WONDERFUL! Lyrical use of color–who needs tube greens!! The one at upper right is my favorite, because those blues just knock my socks off. Excellent compositions and such energy in the brushwork–a time limit really helps that, don’t you think? It works that way for me, definitely. These are great.